An outbreak of salmonella illnesses linked to shell eggs has prompted a nationwide recall of 13 popular brands produced by an Iowa company and triggered a multi-state investigation that is expected to grow, federal health officials said Tuesday. An outbreak of salmonella illnesses linked to shell eggs has prompted a nationwide recall of 13 popular egg brands produced by an Iowa company and triggered a multi-state investigation that is expected to grow, federal health officials said Tuesday. So far, clusters of illnesses linked to eggs have been confirmed in at least three states, California, Colorado and Minnesota, the Centers for Disease Control said. But the agency is looking into a four-fold spike in reported cases of salmonella Enteritidis with a particular genetic fingerprint in late June and early July, said Lola Russell, a CDC spokeswoman. In addition, many states have reported increases in the specific pattern since May. That could indicate perhaps hundreds of illnesses tied to the outbreak, Russell said. On Friday, officials with Wright County Egg of Galt, Iowa, issued a national recall for 13 brands of eggs with a particular date stamp because they had the potential to be contaminated with salmonella. The recalled eggs are packaged under the following brand names: Lucerne, Albertson, Mountain Dairy, Ralph's, Boomsma's, Sunshine, Hillandale, Trafficanda, Farm Fresh, Shoreland, Lund, Dutch Farms and Kemps. 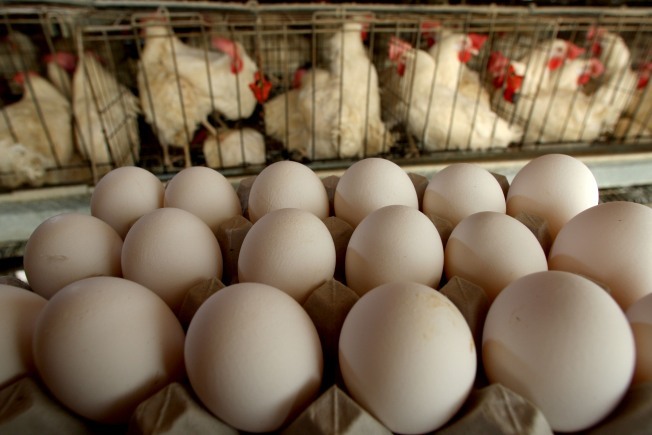 The eggs are packed in cartons of various sizes, including 6-egg cartons, dozen-egg cartons and 18-egg cartons. The federal Food and Drug Administration has launched an investigation at the Iowa firm. Salmonella Enteritidis can cause fever, abdominal cramps and diarrhea that begins with 12 to 72 hours of eating contaminated food and lasts four to seven days. It can cause serious illness in people with compromised immune systems. Consumers shouldn't eat the eggs and they should return them to the store where they were purchased.